We are constantly being reminded that video is one of the biggest and most important forms of online media. But how big is it? We’ve gathered past, present, and predicted statistics for social and mobile video to analyze just how important video is and will be to the future of content creation. If you haven’t already begun investing in video production for social media networks, now is the time. 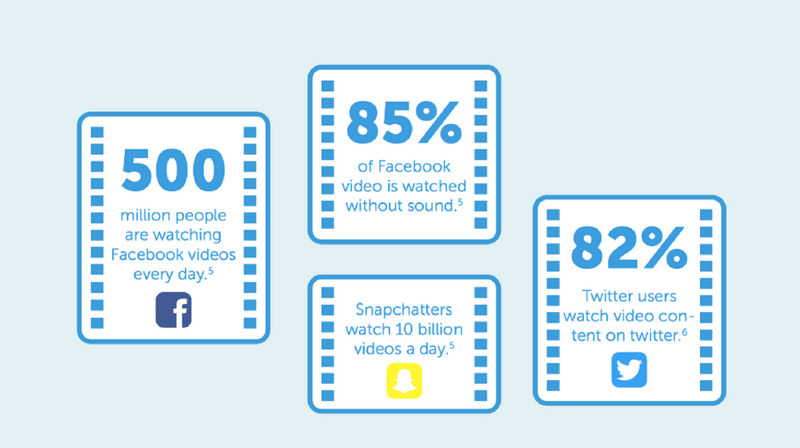 When over 100 million hours of video on Facebook and over 650 million hours of video on YouTube get consumed each day, it’s clear that video is an integral part of consumers’ social and online experience. Newer networks like Snapchat are even rising to the challenge — they surpassed Facebook’s 8 billion video views with 10 billion video views per day. Even though it’s important to note that both companies inflate their video view counts (Snapchat counts it as soon as a snap is opened and Facebook counts a view at three seconds), these numbers are still huge and continuing to grow. Plus, the consumers using these networks and viewing the majority of video are mostly young adults, who are many companies’ target audience. In order to capture consumers’ attention, you need to understand what type of video storytelling works best. While it varies from platform to platform, the format that has gained the most traction on Facebook are captioned, short, emotional, and highly visual videos. Captions are vital to success on Facebook as the network silently auto plays videos in your followers’ news feeds and they watch your video 12% longer when they have captions. The top video news publishers on Facebook in terms of engagement know how to do this well — AJ+, NowThis, Fanpage, BuzzFeed, The Huffington Post, and Fox News are consistently in the top ten. It’s worth looking at the type of content they produce that’s capturing people’s attention online. The good news for journalism and media publishers is that a good portion (33%) of the top video content is hard or soft news-focused. And within video news viewed on Facebook, over 60% of the most successful videos are on hard news, such as politics, current events, and the environment, as opposed to soft news like lifestyle and entertainment. Besides captions, another key trait among the top published videos is that they are short. AJ+’s videos are only around two minutes long and Indigenous Media’s most popular Facebook page is 60 Second Docs. A Reuters study showed that the average length for a native Facebook news video is 75 seconds while 8% of news videos are over 120 seconds and 56% of them are less than 60 seconds. Furthermore, Reuters found that emotional video storytelling, where emotions are favored over facts, sees more success on Facebook. While a video can be both emotional and factual, Reuters found that 58% of the top Facebook news videos primarily invoke emotions, such as empathy, while 42% are primarily based on facts. While Facebook should be an integral part of your digital video strategy, they definitely aren’t the only platform where you should be expanding your audience. If longer form content is where you have the most experience and intent to publish, then YouTube is still the main network you should focus on. The company continues to lead the digital video world in hours viewed each day, length of consumer viewing time, and number of views (8 billion per day in 2015), despite counting views at 30 seconds. This means your longer form content will most likely perform better on YouTube, though you might think about repackaging long videos into shorter clips for Facebook as well as Snapchat, Twitter, and Instagram. Perhaps because social networks are already optimizing video for mobile devices, such as smartphones and tablets, digital video is a huge part of consumers’ mobile experience. Last year, video accounted for 55% of mobile data traffic and this number is predicted to grow to 75% by 2020. To put this in perspective, in just four years from now, it may take over five million years to watch the amount of video that will be uploaded to the internet each month. If publishers wish to stay relevant to consumers today and in the future, they will need to not just create more video content, but also create videos that are highly engaging and of a superb quality. With this much video directed at consumers, it’s a tough world out there for publishers who are trying to get noticed. If you want to be at the top of people’s feeds, you will need to direct more resources than ever at producing digital videos that perform well on social networks and mobile devices. And the top publishers in the world have already figured this out, with 79% of CEOs, editors, and digital leaders investing more money into digital video this year than in 2015. The money that they put into mobile and desktop digital video advertising this year came out to over $10 billion in the U.S. alone. Video is certainly a booming industry and will continue to be as these advertising dollars are expected to reach over $14 billion in 2020. And it’s easy to understand why when publishers investing money in video grow revenue 49% faster than those who do not. If you’re at a loss for how to scale your video content, Storyhunter has professional freelance journalists and filmmakers all over the world who are ready to help. Approach your video strategy in 2017 like your competitors are already doing — with high quality and more content.